American Girl Doll Play: AG Doll Play is featured in Doll Mag! 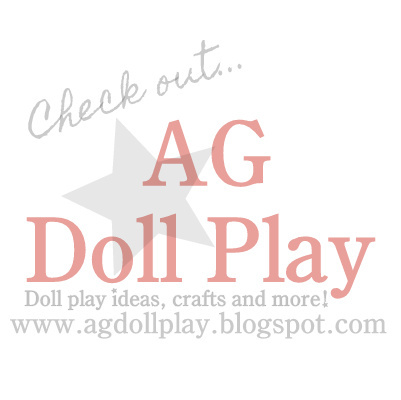 AG Doll Play is featured in Doll Mag! I love it when you are unexpectedly surprised with something good or someone being kind and thoughtful. This is what happened yesterday when I was catching up on my reading of one of my favorite sites, Doll Diaries. Char had posted some of her favorite picks for the week and she mentioned a doll magazine called Doll Mag which I had never heard of (we are still somewhat new to the doll world here when it comes to the web I guess! ), anyways...I followed her link to the Doll Mag site and I started reading the current issue and was so impressed! It's such a great publication and how fun too...as I was reading along I came to the feature, Blogging Girls and I saw AG Doll Play listed as a favorite site of theirs along with a photo of our doll classroom that we made! What a nice surprise! Thank you Doll Mag for the feature and the delightful surprise! Congrats- a well deserved shout out! How fun! I bet that was super exciting! It was a great way to boost our spirits that's for sure! Thanks KC!